On startup the accumulated charge register is set to midscale. Need a way to identify fully depleted battery, only indication is POR mid-scale ACR. Update: If you’re just looking for a simple 1-cell fuel gauge, algorithm based I2c IC’s such as MAX17043 are much, much easier to integrate. Get them on the cheap but tardy Aliexpress or order directly through Maxim. Sparkfun sells a breakout and even provides a library. Update 2: Do not get MAX17043 from Aliexpress. It took me a few hours of fault finding only to discover they were clone IC’s. The clones were detectable by I2c but do not function correctly, they just count the State Of Charge register down from 160% to 0% in a matter of minutes! 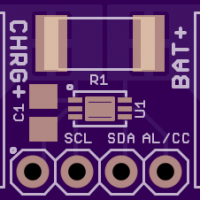 If your MAX17043 is detected at I2c address 0x32 instead of 0x36 it is probably a useless clone… More info here. "I do like that toilet. It's very futuristic, isn't it? Very, sort of, high-tech, space age. I can imagine Buck Rogers taking a dump on that. In the twenty-first century. Can I, have a go?"